Modern Criminal Law of Australia is a comprehensive guide to interpreting and understanding every statutory offence provision in every Australian jurisdiction. The text takes a unique approach to explaining Australian criminal law, emphasising the importance of statutory interpretation, official discretion, element analysis and sentencing, in order to appreciate the meaning and effect of any offence provision. 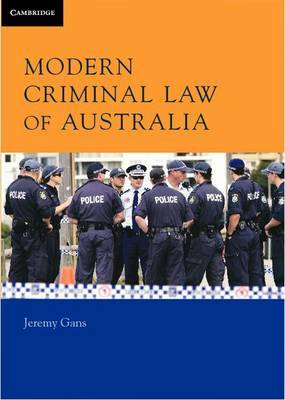 This book sets out the rules and skills needed to advise clients on the potential application of the criminal law throughout Australia. Its scope extends to both serious and minor regulatory regimes, as well as the entire contemporary breadth of the criminal law, ranging from pollution to public order, traffic to trafficking and domestic violence to work safety. It covers the common law, traditional code and model code systems, and includes detailed examples from all states. As such, this unique book provides students with the skills to practise law anywhere in Australia.